Need help understanding all the different woodworking terms? We have some of the answered here. See theses common wood terms to familiarize yourself. AIR DRIED – Air-dried is wood that was not dried in a kiln. The moisture content of air dried wood is affected by where the wood is located. Wood on the coast or in a humid environment will have a higher moisture content than wood in a dry area such as Arizona or New Mexico. BOARD FOOT (BF) – Standard unit of lumber measurement equal to 144 cubic inches of wood. For example, all of these boards would have one board foot of wood: 12 x 12 x 1 inch thick, 3 x 48 x 1 inch thick, 144 x 1 x 1. Board footage is calculated by multiplying length by width by thickness in inches and dividing by 144. Example: 2 x 3 x 36″=216 divided by 144=1.5 board feet. BOLT – length of pulpwood, local lengths vary and can generally refer to anything from 2′ – 8′. “A short log”. BOOK MATCHED – Adjacent pieces of wood from a log cut and opened like a book. When two book matched pieces are used together, it looks like a mirror is between them, the woods match where the splice or glue joint is located. The book matched effect can range from extremely subtle so that it appears to be a single piece of wood, to dramatic with very wavy grains and knots showcased in the piece. BURL – A unique, knotty growth that usually develops at the base of certain trees. A cut through a burl reveals tight bunches of small knots. Burls usually have swirls, twists, or distortion in the grain of the wood, which usually occurs near a knot or crotch. CATHEDRAL – A grain appearance characterized by a series of stacked and inverted “V” or cathedral patterns common in plain-sliced (fiat-cut) veneer. CENTER HEART or PITH – The center of a tree where there is a small hole that seems to be filled with a material soft like cork. Many posts and large pieces of wood have center heart or pith. All trees have center heart or pith. This is where you start counting growth rings in the center of the tree to determine the age. COOKIE – A full round cross-cut slice of the tree. CHECKS – Small slits running parallel to grain of wood, caused chiefly by strains produced in seasoning or drying. CROSS GRAIN – Working perpendicular to the grain. CROTCH WOOD – The section of a tree where a branch divides from the trunk, or the trunk divides in two, typically an area of unique and complex grain. END GRAIN – The grains at the end of a piece of wood that are perpendicular to the surface. FIGURE – The pattern produced in a wood surface by annual growth rings, rays, knots, deviations from natural grains. Grains flow can be interlocked, curly and wavy, or irregular with varied colouration. 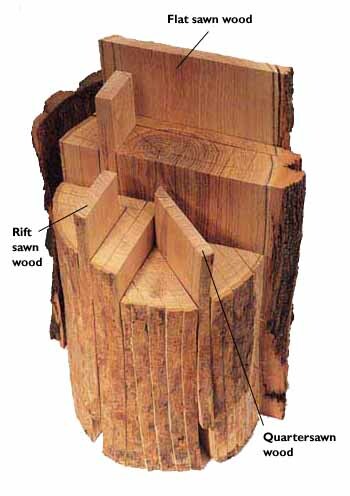 FLITCH – A large piece of wood with or without bark taken from the log meant to be cut into smaller pieces. FINGER JOINT – A series of slits machined on the ends of two pieces of wood to be joined. They interlock together and are held firmly in position with an adhesive. GRAIN – The direction, size, arrangement and appearance of the fibers in wood or veneer. GREEN – Freshly sawn lumber. HARDWOOD – General term used to designate lumber or veneer produced from temperate zone deciduous or tropical broad-leaved trees. In contrast to softwood, which is produced from trees and are usually needle bearing or coniferous. The term does not infer hardness in its physical sense. HEARTWOOD – The inner core of a tree. This wood is usually much darker and denser than the sapwood. 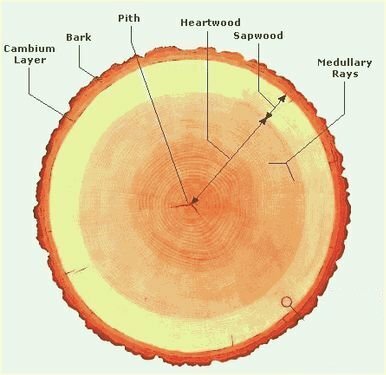 The heartwood of a tree is the center, non-active or dormant part of a tree generally distinguishable from the outer portion (sapwood) by its darker color. INTERLOCKED GRAIN – Grain that has multiple longitudinal directions in alternating layers, typical of many tropical hardwoods. JOINT – The common edge between two adjacent materials in the same plane. KILN DRIED – The process of drying wood in a oven or “kiln” to stabalize and dry the wood for processing. Kiln Dried lumber intended for outdoors typically has 10-12% moisture content while indoor has 6-8% moisture. KNOTS – cross section of tree branch or limb grown into the tree with grain usually running at right angles to that of the piece of wood. Caused by dead branches that were not fully integrated into the tree before it was cut down. KNOT HOLES – Openings produced when knots drop from the wood in which they were embedded. LIVE EDGE or NATURAL EDGE – a style of furniture where the woodworker incorporates the natural edge of the tree into the design of the piece. Live edge furniture often incorporates gnarly wood, sapwood, bark or salvaged wood to create more character. PITH – The soft core in the center of a log. PLAIN-SAWN – Lumber is sawn so that the annular growth rings are parallel to the face of the board. QUARTER-SAWN – Growth rings in quarter-sawn wood run parallel along the entire board. Quarter-sawn wood does not shrink and expand with seasonal variation in moisture as much as flat sawn wood. In addition, because of the orientation of the growth rings, quarter-sawn wood is less prone to shrinkage, twisting, cupping and in many cases rot because sapwood is easier to isolate in manufacturing process. In acoustic guitars, quarter-sawn wood is often used, especially for the sides that must be steam bent to produce compound curves. Quarter-sawn wood has a straight grain appearance achieved through the process of sawing the timber with vertical growth rings. RAISED GRAIN – The roughened condition of sanded wood when the hard late wood rises above the soft early wood when moisture is applied. 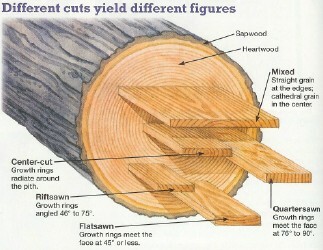 RIP CUT – A cut which runs through the length of a board parallel to the grain. SLAB – A broad, flat, thick piece of wood. S4S – Surfaced four sides or edged and planed. SAP WOOD – The living, outer portion of the tree, usually distinguishable from the heartwood by its drastically lighter color. VENEER – A thin sheet of wood, rotary cut, sliced, or sawed from a log, bolt, or flitch. Veneer often refers to thin slices of wood, usually ¼ inch or thinner that are used in the production of fine woodworking pieces. Veneers are also used to increase the strength of wood and to produce flat panels such as doors, tops and side panels for cabinets and parts of furniture. WANE – An edge of a sawn board where the bark or surface of the trunk still remains. Wane comes from the curved, outer portion of a log. This is also called natural edge.